WAUKESHA, Wis., Oct. 2, 2018 /PRNewswire/ -- Virtually every day, utility customers somewhere in the United States experience a power outage. Now consumers can see where they are occurring — and how severe they are — via Generac's Power Outage Central website (www.generac.com/poweroutagecentral). "We've been tracking power outages for years," said Russ Minick, chief marketing officer, Generac. "Now we're able to share that data directly with consumers so that they can know if their communities are being affected or if a friend or loved one is experiencing a power outage. Power Outage Central is the definitive source for U.S. power outage data, and we're confident it will help consumers be better prepared for outages in the future." 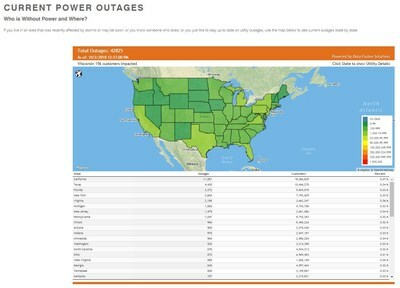 Generac's Power Outage Central compiles outage data into an interactive map of the United States, color coded to reflect the number and severity of power outages at the state level. The cumulative number of outages across the entire country is listed at the top of the tracker, with a tabular ranking of outages by state — from the state with the most outages to the one with the least outages — below the map. Visitors to the site can hover over any state to see the total number of outages across that state. By clicking on a state, they can get detailed outage information by utility as well as a link to each utility's website for additional information. "The outage information is updated every 15 minutes, 24/7/365," Minick said. "During major outage events, like those recently with Hurricane Florence, consumers will be able to get outage updates in virtually real time. But for everyone who is ever affected by a power outage, large or small, the info will help them better manage for today and plan for tomorrow." Generac's hurricane tracker: when a hurricane impacts the United States, consumers can visit www.generac.com/be-prepared/hurricane-tracker to get the latest information on the storm's track and how they can stay safe. That site also contains a variety of content — "Storm Prep 101," if you will — to help consumers get ready for any number of storm-related contingencies. Storm preparedness tips: visitors to www.generac.com/be-prepared will find tips for preparing for everything from high winds to tornadoes to thunderstorms. A severe weather preparedness checklist is available for download, as well. Generac Power Systems, Inc. (NYSE: GNRC) is a leading global supplier of backup power and prime power products, systems and engine-powered tools. Back in 1959, our founder was committed to designing, engineering and manufacturing the first affordable backup generator. Fifty-nine years later, the same dedication to innovation, durability and excellence has resulted in the company's ability to expand its industry-leading product portfolio into homes and small businesses, on job sites, and in industrial and mobile applications across the globe. Generac offers single engine backup and prime power systems up to 2 MW and paralleled solutions up to 100 MW, and uses a variety of fuel sources to support power needs for our customers. We are proud to be named, in back-to-back years, the Frost & Sullivan 2014 and 2015 North American Natural Gas Generator Set Company of the Year. Visit Generac.com for more information.